There is an abundance of ways to make money online. Whether you simply need to supplement your current income or need a way to work from home full time, the internet provides companies with the opportunity to cut back expenses by exploring remote workers. No matter what your circumstances or needs are, there are hundreds of ways to start making money online now. If you are willing to use your skills effectively online, the options are limitless for you. From reselling on platforms like ebay, or etsy, to using your previous work experience to work for yourself as a freelancer, you can craft your services to fit your skill level. As long as you are willing to keep learning and are resourceful, the opportunities only get better with time. Although not everything will provide you with fast money now, these awesome ways to make money in 2016 will generate an income depending on your needs and work ethic overtime. No inventory, or money to get your inventory? That is not a problem with dropshipping. To dropship is to move goods directly from the manufacturer directly to the retailer without going through the usual distribution channels. It means that you can start your online store with little to no upfront costs. Spend your money on a professionally designed website, or create a free one to get started. Blogging is not the best option for those who are in search of fast and instant income, it can offer a lot of financial freedom over time with hard word. 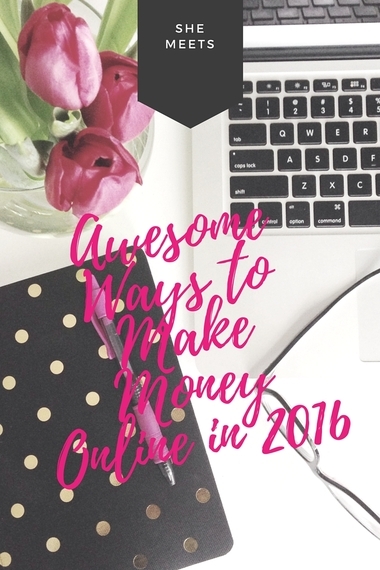 There are an abundance of options for monetizing your blog as your community begins to grow. Starting a blog is also very affordable for those who do not have a lot of money to put into their business early on. As the blog grows, you can develop it overtime. Do you have a large following, are they willing to spend their money on anything that you suggest simply because you are that cool? Affiliate marketing is a great way to monetize your blog. Affiliate marketing involves marketing another companies products and getting a commission. In order to be successful at affiliate marketing, your site has to generate enough sales which means great traffic. A great option for a more seasoned blogger. Becoming an author no longer has to be a long, complicated process. Simply write a great book and begin the process of selling your work through platforms like Amazon. Another great option for bloggers interested in monetizing their blogs, sell your ebooks or other digital content on your website if you have a very engaged blogged following. They are fun, and oh, so popular, and have the possibility of helping you make quite bit of change. The average Udemy instructor makes $7,000. Simply throwing together a course that does not deliver much value can work against you, however. Taking the time to offer something wonderful to your students and community is essential. Are you a great writer? Offering your services to businesses and bloggers can result in a successful work from home business. Create an online portfolio for easy access, or use your blog as a resume that you can share with potential clients. Writing for reputable websites can be another great way to show potential clients that you have what it takes to create one of a kind, incredibly engaging content. Do you have office management experience? Virtual assistants today are brilliantly able to offer a wide variety of services. The more resourceful you are, the more successful you can be in this field. Choose your own hours and work with clients located all over the world. I have had the opportunity to offer services to clients in Australia, New Zealand, England, New York, and even locally in my small town of Ohio, from my little home office. There are an abundance of work from home opportunities. The key is simply finding the right fit for your lifestyle and skills. Nancy Laws is the founder of SheMeets, ready to walk in your purpose fearlessly and boldly? Take her free email course, 14 Days to a Bolder, Fearless You!